Oh, would you please stop it! How can I resist? So how long do we have to wait for a pic? Gee... just leave us all waiting with anticipation!! Such a COOL idea! GOTTA have... GOTTA have..... oops! Did we say that out loud??? LOL!! Put us in for 2! Well, the glow-in-the-dark translucent experiment that I didn't tell too many people about was a failure. (yeah, it was going to be neat). Oh well - the regular translucent suncatcher (warm and cool colors) are still a go! Schedule is currently: samples and photos the week of the 17th, orders late July, ship mid-August. Samples are in! Orders and coins will be available in August. They came out really nice Crake. WoW - I lOVE IT!!! Very well done. I do stained glass work and these turned out so COOL. I'll be getting a couple for sure! Keep up the good work, your designs are always awesome! Sweet, I'll definitely get one of each... All CRAKE coins are great! Wow well done I will be getting a few for sure very nice, any word on the price? Awww Ohhh...the samples are beautiful! I can not wait to order! I would agree that they are very nice. 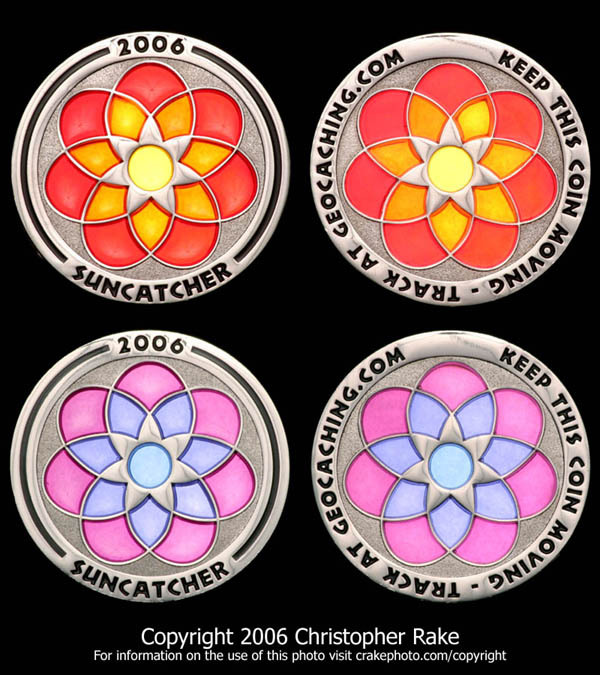 Just wonder why the above "poster" doesn't have a problem with the geocachers name not being on it when the above "poster" does have a problem when others don't put their caching name on other coins. I quote the above "poster" from another geocoin discussion "Too bad they neglected to put their geocaching nicks on the coin. Then I think it would be a fantastic personal geocoin. As it stands right now, it's a generic coin that somehow managed to get approval for tracking numbers. Shame." end quote. Guess it may depend on the coin maker? Just food for thought. But enough of that. Look forward to seeing these in a cache. At least I hope someone turns some loose. Just a quick note,CRAKE usually has his name along the edge of his coins. Yet another outstanding coin from -CRAKE- Count me in !!! Will they be trackable ??? Could ya please clarify ?? Good point; I don't see a spot for a tracking number. Assuming it's on the reverse? And is that, in fact, two different color schema? Nice work, either way. Trackable - YES these are Groundspeak trackable. The number goes between the .COM and KEEP. The Samples I talked about in the email are not trackable since they are samples. However the standard issue coins will be trackable with a custom icon. Color Schemes - There are 2 color schemes: warm and cool. Price: $7.90 each or 1 of each color for $15. Availability: Orders in early August, and ship late August. Name on coin: My name is always somewhere on the coins I make for myself. Usually along the edge. Coins I make for others depends on that individual's desires. Thanks for the clarification crake, and as always, nice work !!! Just wonder why the above "poster" doesn't have a problem with the geocachers name not being on it when the above "poster" does have a problem when others don't put their caching name on other coins. I quote the above "poster" from another geocoin discussion "Too bad they neglected to put their geocaching nicks on the coin. Then I think it would be a fantastic personal geocoin. As it stands right now, it's a generic coin that somehow managed to get approval for tracking numbers. Shame." end quote. Guess it may depend on the coin maker? Will there be one icon or two? Excellent question. There will be 1 icon, and it'll probably be the warm colors since that is how the design has been represented over time. 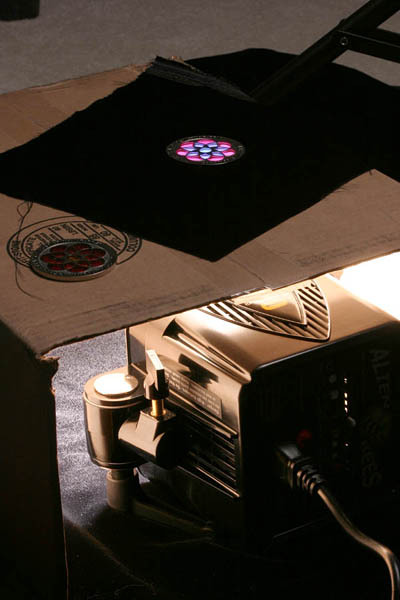 This is how I took the photos of the coins. Note how the light shines through the coin! It is a great coin! You have all the cool equipments!!! I'm jealous! Those are beautiful! We'd like one or maybe two sets. Wow its nice to see some art that I can afford, I am in for at lest 3 or 4 of each for sure. I am sure these will we sought after for trades in the future. Awesome! I'd like some of these, too! Beautiful! My daughter wants a set. Yes OBC & SLP is Smiling at this one Gotta have a set Please . You will see our order just Beautiful..Thanks for the hard work. Assuming I have money when you start invoicing, I would like two warm/cool sets. you can just order from the site direct? or are you invoicing people who answered you? i joined your mailing list so will i get an email when it gets to the site? How many are you making? I am going to be in the wilderness the first week of August and am just wondering if there will be any left when I return. 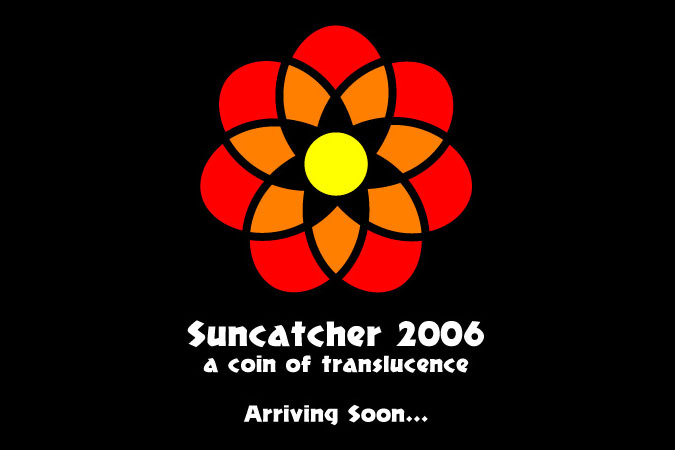 You will be able to order from the suncatcher webpage (per forum rules I can't post a link directly to the store, but you'll be able to get to it from the coin's page). Status update: A minor tweak is required, so orders are now expected to open week of Aug 7th with estimated shipping by Aug 28. Wow, those are really beautiful. Count me in for a set! It turned out great! Definitely going to pick up at least two sets, nice price for a set of coins. Crake, you're not helping with my geocoin addiction. LOL. Keep 'em coming!! I love your work. Waiting with bated breath !! !